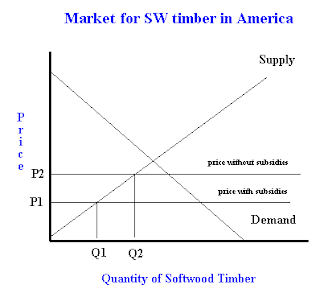 US and Canada’s trade agreements, and the effect of NAFTA on softwood timber - FreeEconHelp.com, Learning Economics... Solved! The US and Canada have had many disagreements over the softwood timber trade. These disagreements are caused by Canada’s policy of taxing the production/harvesting of softwood timber in Canada. These stumpage fees (named after the stump left behind after harvest) were started because much of the harvesting of timber in Canada is done on public land. Because these fees are so low, US produces view the fees as a form of a subsidy. Because of the subsidy, American firms are unable to match Canadian producer’s low prices. goods are exported at below market, or cost, prices causing domestic firms to be uncompetitive and to potentially lose or go out of business. The US’s response to dumping is to put quotas or tariffs on the questionable good. As recent as 2002, the US has imposed tariffs on Canadian softwood timber. This tariff was established at 27%, and therefore significantly increased the price of softwood timber to American consumers. Canada challenged the tariff, and in 2006 about 80 percent of the amount earned form the tariffs (more than $5 billion) was ordered to be returned. This decision was made by the panels of the North American Free Trade Agreement (NAFTA) and the World Trade Organization (WTO). To understand the effect of stumpage fees on the American economy, we could start by considering a simply supply and demand graph for American softwood timber. As you can see in the graph, domestic supply of softwood timber (for America), is higher at Q2 in the absence of subsidies (each horizontal line shows the world price, or price of imports). American firms also receive a higher price for their product in the absence of subsidies at P2. However, when these stumpage fees are allowed in Canada, the price of timber goes down to P1. So while consumers in America benefit, producers lose out. Not only do producers in America produce less (Q1), they also receive a lower price (P1). It would be in American producer’s best interest to fight the subsidies granted by the Canadian government. However, NAFTA and the WTO disagree with American producer’s arguments. These free trade organizations have sided with Canada in this argument, and have ruled against the United States' imposing of tariffs or duties on Canadian softwood. This ruling is fortunate for Canada, because a lot of Canadian jobs depend on the export of softwood timber. Without these jobs, many Canadians would have to look elsewhere for employment. Fortunately, the United States and Canada came to an agreement in 2006, and the US had to stop its tariff program. The stipulations of the deal would stay in place for 7 years, so these countries will not have to deal with this issue again until 2013, which is quickly approaching. When compared to alternative places, the start-up business in North American nation ranks among the bottom. It usually prices around zero.4% of average financial gain of one person and lowest capital is 1/3, for more information click here emplois informatique à montréal.